To determine the scope and outcomes of nephron-sparing surgery (NSS), i.e. partial nephrectomy, across the UK and in so doing set a realistic benchmark and identify fresh contemporary challenges in NSS. In 2012 reporting of outcomes of all types of nephrectomy became mandatory in the UK. In all, 148 surgeons in 86 centres prospectively entered data on 6 042 nephrectomies undertaken in 2012. This study is a retrospective analysis of the NSS procedures in the dataset. A total of 1 044 NSS procedures were recorded and the median (range) surgical volume was 4 (1–39) per consultant and 8 (1–59) per centre. In all, 36 surgeons and 10 centres reported on only one NSS. The indications for NSS were: elective with a tumour of ≤4.5 cm in 59%, elective with a tumour of >4.5 cm in 10%, relative in 7%, imperative in 12%, Von Hippel–Lindau in 1%, and unknown in 11%. The median (range) tumour size was 3.4 (0.8–30) cm. The technique used was minimally invasive surgery in 42%, open in 58%, with conversions in 4%. The histology results were: malignant in 80%, benign in 18%, and unknown in 2%. In patients aged <40 years 36% (36/101) had benign histology vs 17% (151/874) of those aged ≥40 years (P < 0.01). In patients with tumours of <2.5 cm 29% (69/238) had benign histology vs 14% (57/410) with tumours of 2.5–4 cm vs 8% (16/194) with tumours of ≥4 cm (P = 0.02). 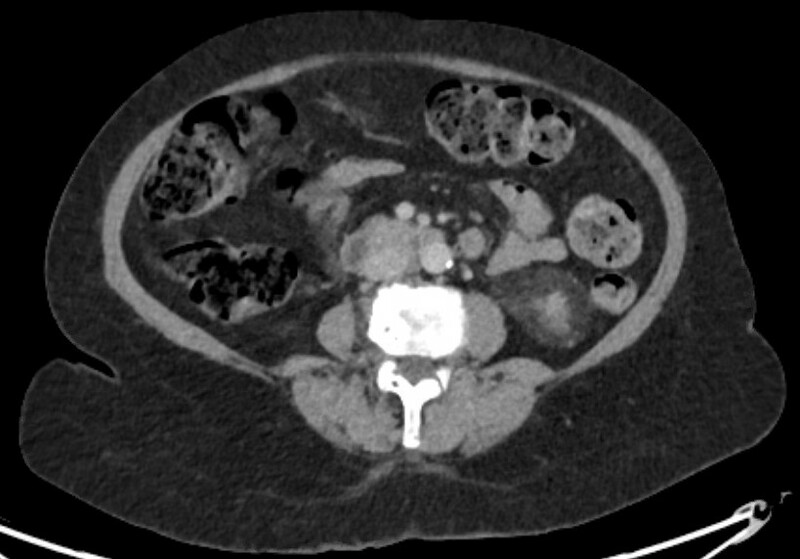 In patients aged <40 years with of tumours of <2.5 cm 44% (15/34) were benign. The 30-day mortality was 0.1% (1/1 044). 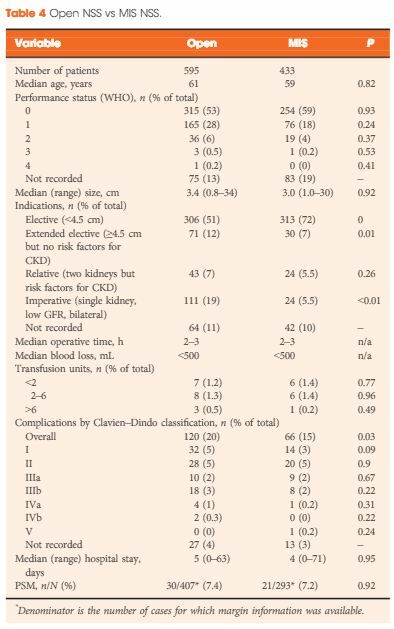 There were major complications (Clavien–Dindo grade of ≥IIIa) in 5% (53/1 044). There was an increased risk of complications after extended elective NSS of 19% (19/101) vs elective at 12% (76/621) (relative risk [RR] 1.54; P < 0.01). Margins were recorded in 68% (709/1 044) of the patients, with positive margins identified in 7% (51/709). Positive surgical margins after NSS for pathological T3 (pT3) tumours were found in 47.8% (11/23) vs 6.1% (32/523) for pT1a, tumours (RR 5.61; P < 0.01). 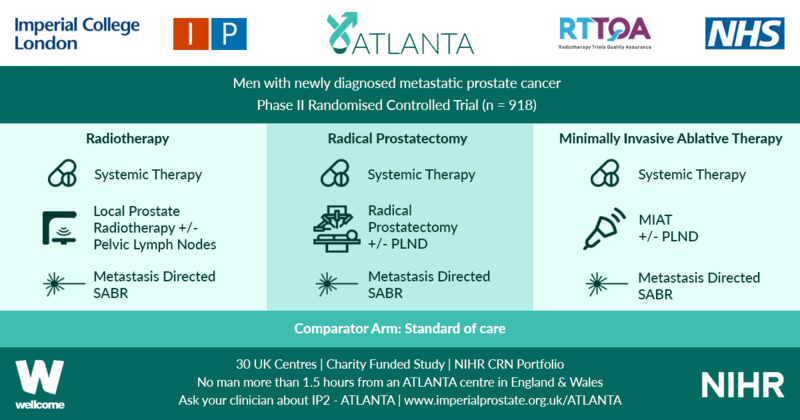 In all, 14% (894/6 042) of the patients underwent surgery for T1a tumours: 55% (488/894) by NSS, 42% (377/894) by radical nephrectomy (RN), and in 3% (29/894) the procedure used was unknown. Major complications after occurred in 4.9% (24/488) of NSS vs 1.3% (5/377) of RN (P < 0.01). Limitations included poor reporting of renal function data and no data on tumour complexity. In its first year, mandatory national reporting has provided several challenging contemporary insights into NSS.